...I just noticed an oddity, wherein Devy's eyes are glowing blue in your sig, but red everywhere else, including the flashback. Hrm. Okay, when I said "chat later", I did mean for it to be this much later. But I had a few things to sort out. Hylian Pirate wrote: I never thought I'd say this, but "Poor Devastator." Yeah, I kinda feel bad for the guy. Not so much in a "I want to give him a hug" kinda way, but more like a "I want to take him out to the bar for a few rounds of booze and blonde bashing" kind of way. And then maybe help him with the Lego town. Make a few changes, just to mess with 'em. Like, maybe this house doesn't really need a door after all. The Lego men are jerks anyway. I doubt Devastator would take hugs too kindly anyway. ...well, hugs that are not from Mao that is. Besides, when Devastator builds, he does it for himself and himself alone. As for Arnval, her nightmares have only just begun. Xehn wrote: ...I just noticed an oddity, wherein Devy's eyes are glowing blue in your sig, but red everywhere else, including the flashback. Hrm. If there were others who noticed this, you're still the only one to point it out. Going through your logs on DA and I remembered after seeing your SC IV custom characters, I once saw a PERFECT representation of Angol Fear from Keroro Gunso (aka SGT Frog) on a tabletop gaming store's Xbox 360. It was awesome. 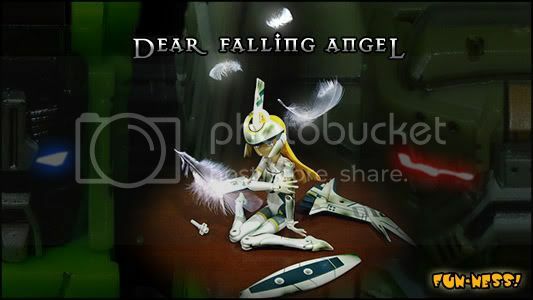 blade_anime wrote: Going through your logs on DA and I remembered after seeing your SC IV custom characters, I once saw a PERFECT representation of Angol Fear from Keroro Gunso (aka SGT Frog) on a tabletop gaming store's Xbox 360. It was awesome. That's because she's isn't a custom, but a special guest character, endorsed and designed by the same guy behind Keroro Gunsou. Congrats on the new job, Dila.